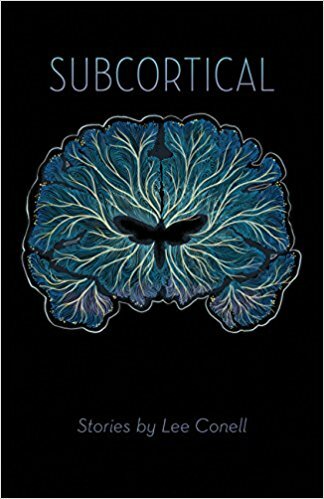 As the title implies, the stories in Lee Conell’s Subcortical (Johns Hopkins University Press 2017) are brainy, exact, revealing, empathetic, and witty. The collection opens on a Midwestern daughter recalling her mother’s stories of her teenage experiences, then range from a woman’s first job working on the atomic bomb in Tennessee to fracturing lovers in Berlin, and move through the boroughs of New York City, before ending in Manhattan at high school girl’s Groupon high tea with her mother at the Pierre Hotel. Conell’s comfortable specificity gives each story the added character of the setting, allowing the reader to feel like a native, rather than a tourist. There is someone here every reader will know: teenagers struggling to define themselves in worlds that have already defined them, lovers who are brought together by every type of force except love, dysfunctional families functioning. Conell invites us into our own world with new eyes that capture the extraordinary details of the everyday and experience the extraordinary as merely mundane, like the young woman prostituted by her doctor-lover as part of his experimental “treatment” for homosexuality. She observes that the doctor’s “tears were large and shiny and reminded me of glistening fat” when unsurprisingly, the web of relationships and experiments go woefully wrong. Conell’s stories are elbow-patch-professor intelligent but never pretentious. They are nerdy in the best way, integrating complex theoretical concepts and hyper-specific science into the ordinary parts of these characters lives, things as normal as doing homework or commuting. The stories are also built around these nerdy obsessions: the crystallographer tracing the patterns in her life and her identical twin sister’s, the absurdity of a pretentious grandchild and a mid-century science-fiction movie bringing out the monstrosity of Ruth’s early career at an atomic bomb facility, cow gastrology, and conspiracy theories. Like many people’s experiences, the stories live not-quite in the genre of science fiction and magical realism but in the realm of curiosities, the unexplainable, and the crackling space between magic and science—there’s Cooper’s unlikely alliance with Frank, the ghost of an apartment’s previous tenant, and a myth come to life when turtles send Mallory signs of her missing uncle. Then there’s the unsettling return of Joan’s invisible childhood playmate at her dying mother’s hospital. Conell hits the economic nerve of our time; critiquing the subtle and not-not-so-subtle ways that financial insecurities poison society. We laugh at the men who make money off tourists as Elmo in Times Square, but see how enticing such an identity change could be for a man who lost his job in the recession. One of Carly’s many teenage mistakes in “Four Stomachs” is coming home from a failed attempt at college with “a mess of student loans.” In“The Sextrology Women” a boyfriend tries to bridge the socioeconomic gap: “Chloe’s dad was in finance. Aaron’s dad was in mold.” He fails. While not a bleak book, Conell isn’t offering a varnished glorification of the past or a saccharine hope for the future. These stories ask the reader to look closely at our present moment, to uncover its wonders and marvels. These stories are a reflection rather than a solution.They’ll do better than break your heart—they’ll shake it up and set the pieces cascading like snow in a globe, settling eventually in a familiar but different arrangement.